A masterpiece home is not your ordinary home. It is found in the finest neighborhoods and tucked away on acreage sites. A masterpiece home makes an impact on those who see it and informs the finest living environment for the family who lives there. It stands to reason that creating a masterpiece home involves multiple steps and many details. Most masterpiece homes involve site amenities such as gates, boat docks, water features, golf cart storage, etc. The interiors also tend to involve elements like feature walls, intricate tile details, draperies/shades, and specialty doors. Those particulars must come together to form a cohesive, balanced whole. Because of their size and level of detail, getting everything just right in a masterpiece home takes time and effort. Different professionals with unique skills come together to work on it, and that can also add another level of complexity to the project. However, the result of all of the effort is something so beautiful and timeless that it transcends all the hard work. Most people only build one masterpiece home in their lifetime. So it is important to get it right. After all, everything about a home is a reflection of its owner. So what does it look like to go through this process and finish with a true masterpiece? We asked some of our clients who have been through it to weigh in and share their experience. 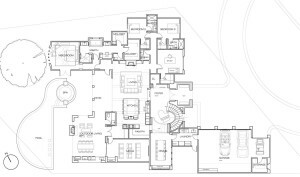 Step one in the process is developing the floor plan and site plan from the Lifestyle Analysis interview, our system for understanding what is important and how it should perform for the home owners’ everyday lives. A well-designed floor plan will maximize views, capitalize on breezes, minimize sun exposure and will function for the way the family lives in the home. As one client explained, “We’ve lived in homes before where we had to just make things work the way they were, but when we designed our home with Jenkins, we got to choose exactly how it should function for the way we truly live.” She went on to explain that initially they thought their previous home’s layout might work well for the new home site. They even brought their floor plan in and showed it to the team. However, the design team surprised them by proposing some unique twists to the old favorite. “After the Lifestyle Analysis interview, they all knew my taste and preferences so well that they were able to keep the things that were important to me but change the things that could and should be better, especially for the property that we were building on”. So often there are things about our lives that could be improved with a few subtle changes, maybe even new technology or features that we didn’t know exist. Having a team of professionals who not only have knowledge about features that are available and how they perform but who also understand the specific family and their lifestyle can really add value to the project. Once the floor plan is established, the details for the exterior and interior begin to develop. This is where colors, textures, materials, size, and balance begin to evolve. It is also where the lines between Architect and Interior Designer begin to blur. Certain items, such as window placement and exterior colors, for example, affect both interiors and architecture. In fact, it is safe to say that the overlap between these two disciplines can cause confusion at times, especially when the different disciplines work for independent firms. Recently, the design team presented the interiors of a masterpiece home. This particular home is a waterfront Mediterranean style home with elegant, timeless interiors. In this early phase, the interiors are conceptual rather than fully developed. So the team presented each room in conceptual form, explaining their vision for the spaces to get client feedback. After hearing the client’s thoughts on each room, the spaces get developed into 3D visualizations, or renderings. These will be photo-realistic “pictures” of what the room will look like with all the right materials and colors. 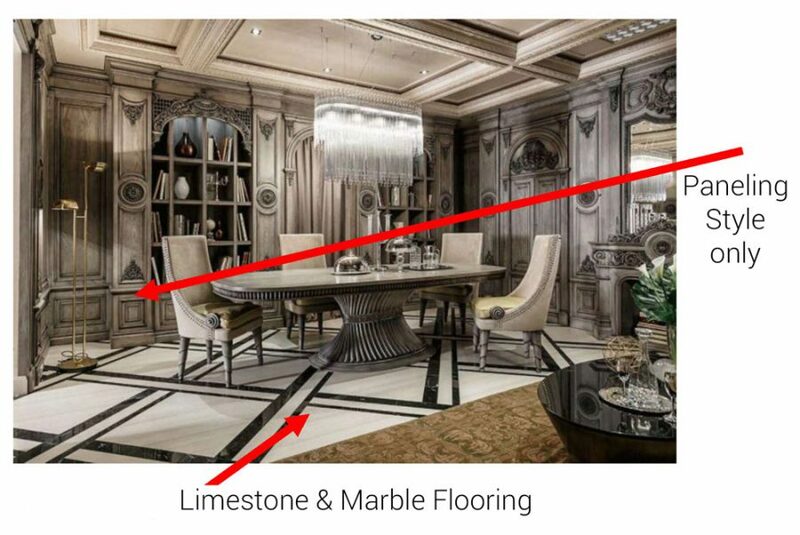 As one of our clients recently told us, “If I had known the level of detail and understanding I was going to get about the spaces in my home while we were designing it, wow! I just didn’t realize the incredible visuals that we were going to get during the design process, but it made all the difference.” Of course, that step comes only after this concept phase is complete. This is one of the Dining Rooms in the early concept phase, below. The design team clarified that not everything in this first image represents the space. For example, they explained that the paneling style height and scale but without all the applied overlay pieces represented the style they wanted to use on a feature wall. 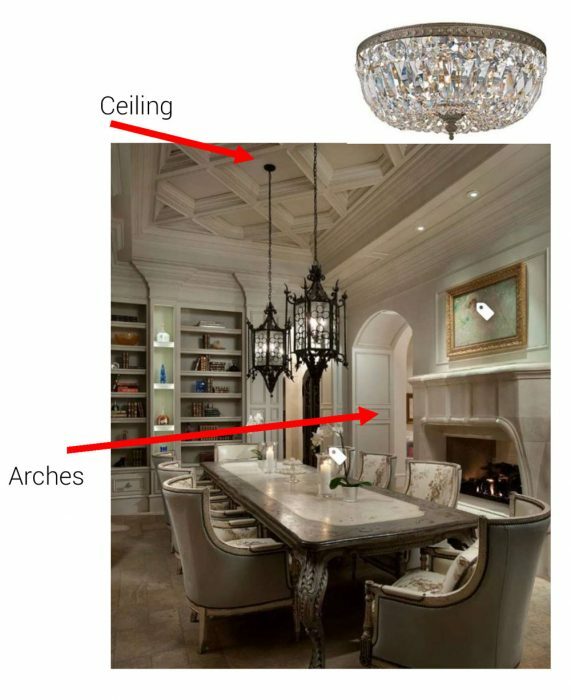 They talked about the height of the space and how this style would work in their dining room. They also discussed the flooring and how it would look with the accompanying floors in the next room and how they would tie it in so that it would flow. They reviewed how they would balance the space, being careful not to go quite so heavy as the inspiration photo but how they did like the overall tone of the room. They also discussed lighting. This client prefers not to use chandeliers. So the team found a solution for a great look with the ceiling detail they are planning. they also talked about these paneled arches that will be strategically-placed throughout the home and how they will be treated in the various areas. Next they discussed the concept for one of the bedrooms and presented the image below. The design team wants to do a feature wall with paneling with a muted tone-on-tone stencil in this space. They again clarified that it would be more subtle than the photo. Then, the hand-carved fireplace would mimic some of the detail in the walls. They stressed the fact that this specific fireplace is a bit too heavy and that they would be drawing something much simpler for their space. They also felt an entry door with similar characteristics would add a nice touch to the space. The owners decided they prefer a stained door, which was great feedback for the team. The rest of the home followed a similar procedure, and the team left with pages of notes and a much better understanding of where they are taking the design next. As the design evolves, all the small details will become a part of the imagery, including tile layouts and paneling designs. After working through this process, the team will be ready to move the project into the field for construction. At that point changes should be minimized, since the owners have visualized the finished look and understand how it will come together. While creating a masterpiece home takes a little more time and effort, it is not that different from the way we handle the design process for all our homes. After all, every home is a masterpiece to its owners. Treating every home like a masterpiece home has one major ancillary advantage: careful planning reduces changes and mistakes. Reducing changes and mistakes in turn creates a better experience for the home owners and better overall product. After building luxury homes for almost three decades, that lesson has been reinforced time and time again.